Today was incredible. I couldn’t be happier with how this trip is going. We visited a local farmers market this morning to pick up some more produce and see what they had. It’s near our condo, and the plan was to walk down there, but we had to run some other errands as week and decided to stop by on our way back to the condo vis car instead. We found ourselves surrounded by beautiful produce. We got pineapple, papayas, corn, sweet potatoes, tomatoes, green beans, cucumber, carrots, guacamole, chips… yeah, we got a little carried away. But it all looked so amazing! How could we resist? Thirty dollars later, we set out for home. Naptime followed soon after we got home, and I took advantage of the fantastic shared lanai area. 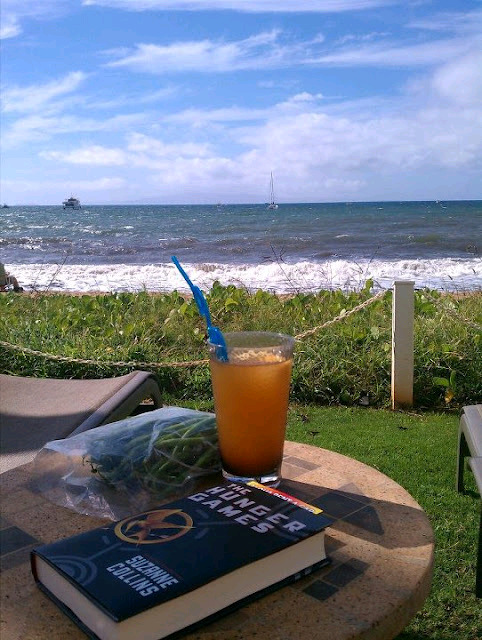 A cocktail, great book, fresh green beans and fantastic weather rounded out the afternoon. Ben joined me, monitor in hand, and we sat in the sunshine while C napped. After naptime, we spent some time on the beach with C, playing in the waves and building sand castles. 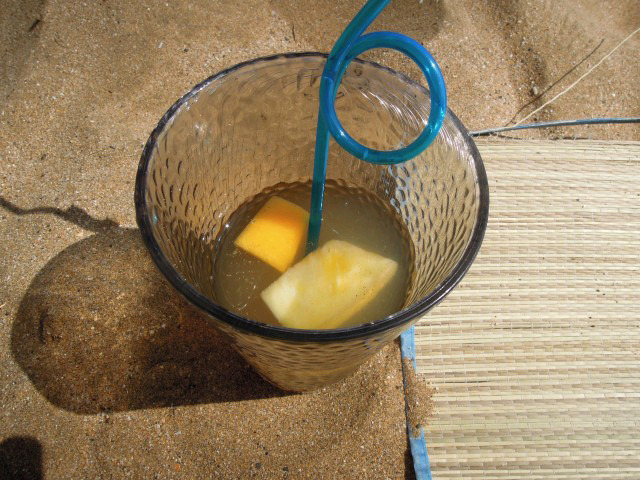 Not wanting to miss the opportunity to enjoy the last of my cocktail, I brought it down to the sand with me. The wind was pretty aggressive, and every move seemed to dislodge sand and send it flying. Right into my drink. C wasn’t sure about the water at first, but was starting to get more comfortable with it by the end of the day. She’d look at the waves and say, “It’s a little bit scary for her.” It helps that the water wasn’t cold, although I wouldn’t call it tepid by any means. I was expecting Florida water, but instead it feels more like southern California. I guess I’ve been spoiled by Florida beaches. We picked up some ahi tuna steaks to grill for dinner tonight. 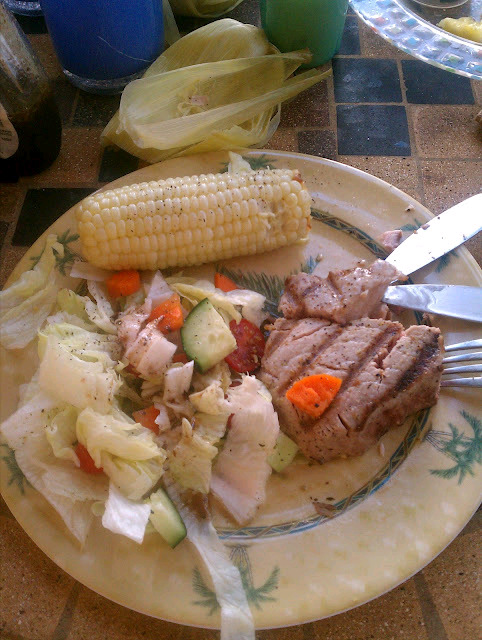 We paired them with sweet corn on the cob and a green salad made with fresh veggies from the farmers market. Despite the fact that our grill at home rarely sees fish on the rotation, Ben did a great job. We were aiming for seared, but the unfamiliar grill made it difficult to perfect. It was still a great dinner. We’ve been sandwiching activities around nap time, which has worked out well so far. Tomorrow is our first “adult time” away from C. We have a nanny service scheduled so we can get away for a couple hours. It’s mainly during C’s nap time, so she won’t miss out on much, but it will be nice to get out without a toddler in tow.